Except when it comes to job creation. Over the last few years, government jobs have been awfully consequential in Texas: 47% of all government jobs added in the US between 2007 and 2010 were added in Texas. The chart shows that Texas employment wasn’t down much at all in these years, as the state lost only 53,000 jobs. But looming behind that number are large losses in the private sector (down 178,000) and large gains (up 125,000) in government jobs. Now, this was a period when the nation lost close to eight million jobs, so this churning in Texas is a very small drop in that bucket. But it sure doesn’t match the Governor’s anti-government rhetoric. In fact, as the table below shows, the nation as a whole added 264,000 government jobs, 2007-10, meaning public-sector jobs added in Texas account for almost half of the nation’s public-sector jobs over these years. Now, I’ve got no problem with a state government using Recovery Act funds to retain or create jobs. In fact, the figure and quote above shows Texas to be following a traditional Keynesian game plan: as the private sector contracts, turn to the public sector to temporarily make up part of the difference. So, no disrespect Gov, but when you’re getting your Keynes on like that, no need to hide it behind all that anti-gov’t rhetoric. Share the post "Texas and the Gov’t: Better Friends Than You’d Think"
30 comments in reply to "Texas and the Gov’t: Better Friends Than You’d Think"
I often find myself applauding your tact and kindness. So I’ll say it… Just more hypocrisy and falsehoods from a Republican – presidential candidate no less! If Perry could bring himself to have an honest accounting of the various factors that went into Texas’ “miracle”, and explain why they did things the way they did and what helped and what hurt – *that* would get my attention. I love this blog! Thanks for pulling the data together to show the wackiness that is so common with some of these guys. So, when Rick Perry says he balanced the Texas budget without raising taxes, the truth is that Barack Obama balanced the Texas budget without raising taxes. Texas employment levels have been growing since Jan 2010. 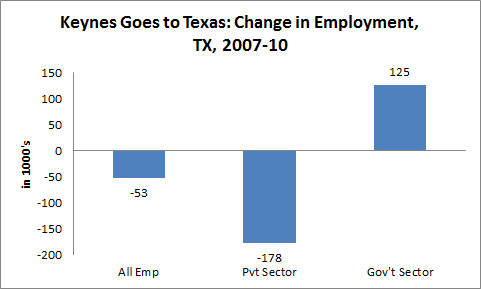 Unlike most states, Texas private sector growth has not been offset by cuts in government jobs. Indeed government jobs have grown by over 50,000 since then. The “Texas miracle” in job growth–i.e. total job growth that other states can envy–is attributable to government job growth (especially if you consider the multiplier effect of government job growth). Does the State of Texas hire Federal Government employees? I thought it was the Federal Government. Did the State of Texas use ARRA money to hire Federal Government employees? I thought it was the Federal Government. My understanding is that they used federal stimulus money to plug holes in their budget and where therefore able to retain current employees and hire new ones. State employees are still public sector or govt employees. Fed money can help the state employ state/public sector/govt employees. What is your misunderstanding, I wonder? I guess if Perry wants to claim credit for goading Obama into hiring a bunch of federal employees, he’s free to do so. Implicit to many modern economic thinkers and readers are the critical perspectives of 19th century political economists and the 18th century moral philosophers as Robert Reich recently commented. I say implicit since I cannot comprehend how formally educated people can speak or write about economic issues and speak about jobless recoveries in the same breath. Isn’t there a public purpose to the social sciences in general and economics in particular? Now, I sense that Gov Perry’s anti-government rhetoric is symptomatic of this observation in particular and his party in general. Is it that only microeconomics ir real to them and macroeconomics is either denied or considered metephysical with no empirical reality? Keynes should have included this group in his economic paradoxes! Their arguement only shouts no macroeconomics, no Keynes, no Democratic party, No Obama? No, No, No,…despite the empirical economic data provided by this essay and the public purpose of Keynesian economic policies. Love to believe this, But Political Math had some interesting numbers yesterday, that contradict yours. Care to comment? Yep–s/he messed up. The 70K number comes from seasonally unadjusted data–you can’t compare Dec07 to Jun11 using NSA (not seasonally adjusted data). If s/he used the correct (seasonally adjusted) data, they would have gotten 112K. I used the annual data to avoid any seasonal issues but mainly because the BLS does not provide seasonally adjusted data for the private sector which is an important part of my comparison. I’ll leave this note on their site but would be good if you would too. Do your numbers include census workers? All mine are seasonally adjusted. So why the disconnect? Perry must be polling well against Obama. Of course everyone is polling well against Obama except Elmer Fudd. Why don’t we see reporting like this on the Democrat establishment? OMG! So it was Obama who created all the jobs in Texas???? Well, how did Obama manage to fail in the other 49 states??? Finally, great reporting. It’s almost too bad it didn’t come out later during the Perry vs. Obama debate. Texas may have produced a lot of minimum wage and government jobs, but how many great, innovative companies have they created in the last 15 years? I don’t see any Googles, Facebooks, Zynga or Yelps. I’ll give them Dell, but then California has created Yahoo, Oracle, Cisco, VMWare, Juniper and dozens of others in that period. They do have South by Southwest, but that’s in the liberal patch of the state. I’m glad to see this come to light, but I wish Mr. Bernstein had gone into more depth about the origins of the gov’t jobs. How many were jobs for which Gov. Perry would’ve been able to claim any credit? What role did he have in seeking stimulus money and/or government jobs for TX? That way, we would know if the only point to be taken from this news is just that Gov. Perry overstated the state’s performance or whether he was also being hypocritical about his views on government (was he seeking out government monies and jobs?). I’d also like to see what comments Gov. Perry may have made about the federal stimuli and bailouts to see how they correspond with his current rhetoric. State government jobs. TX: Up 8.4%. U.S.: Down -0.1%. Local government jobs. TX: Up 6.1%. U.S.: Down -1.7%. Private-sector jobs. TX: Down -0.5%. U.S.: Down -6.6%. Healthcare jobs. TX: up 12.6%. U.S.: Up 6.2%. Here’s the likely hole in this party boat: Rick Perry is all about doing away with FEDERAL government, and pushing that responsibility to the states… IF, in fact, the majority of these government jobs are STATE jobs, then I’ll wager he’d be supportive and in fact proud of it. Looking back on the Governor’s complete tenure doesn’t change the picture much. From 1 January 2000 to 1 June 2011, Government jobs increased 21%; Energy jobs 73% (real oil prices more than doubled over the period); Education and Health jobs 44%; and Professional & Business Services (PBS) jobs 22%. Here’s the funny thing about PBS – many DoD contractors fall under PBS so they’re Government dependent too. Why do liberals insist on describing Perry, et al’s statements as “anti-government.” Except for a tiny percentage of anarchist libertarians, no one is anti government. Perry et al believe the Federal government has overreached its legitimate functions – as, according to the Constitution, they most definitely have. That overreach is a significant factor not just in our current economic problems, but in the cultural and moral issues facing the country, as well. Progressives need to get a whole lot more honest if they expect to do more than preach to the left-wing choir. Thank you Jared — facts pointed out much appreciated. Among all 50 states, Texas, which forms the bulk of the 11th Federal Reserve District (the Federal Reserve Bank of Dallas), enjoyed the biggest proportional increase (2.282-fold) in total federal spending received from 1998 (http://www.census.gov/compendia/statab/2011/tables/11s0477.pdf) to 2008 (http://www.census.gov/prod/2001pubs/sta tab/sec10.pdf). Nevada and Arizona, both of which lie in the 12th Federal Reserve District (the Federal Reserve Bank of San Francisco) that includes California, were 2nd (2.281-fold) and 3rd (2.257-fold), respectively, in terms of proportional increase in total federal spending received from 1998 to 2008. New York, which is the largest part of the 2nd Federal Reserve District (the Federal Reserve Bank of New York), ranked 45th in proportional increase (1.745-fold) in total federal spending received from 1998 to 2008. From a Keynesian perspective, then, it should not be surprising that a comparison of job growth among the Federal Reserve Districts shows the 11th performed best, and 2nd performed worst, and the 12th was about halfway between the extremes, as Dallas Federal Reserve chair Richard Fisher pointed out in a recent speech (http://www.dallasfed.org/news/speeches/fisher/2011/fs110817.cfm). It could also be argued that credit for job growth in Texas should be given to federal spending, rather than to Governor Perry or any other popularly attributed cause. Nevada and Arizona, both of which lie in the 12th Federal Reserve District (the Federal Reserve Bank of San Francisco) that includes California, were 2nd (2.281-fold) and 3rd (2.257-fold), respectively, in terms of proportional increase in total federal spending received from 1998 to 2008. *California was 32nd (1.856-fold) in this regard.